From June 20 to 22, the second open-air exhibition for plant production “International Field Days Ukraine” took place in Doslidnytske, Kiev Region. During the three days, over 3,500 farmers, representatives of agricultural companies, scientific and political institutions had the opportunity to get to know the latest innovations of the world’s most renowned companies of the agricultural industry. 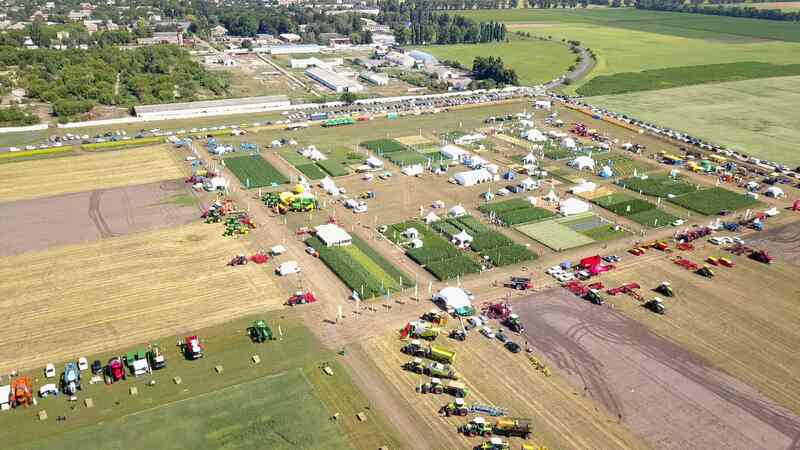 Altogether, 128 companies from Ukraine, Germany, Austria, France, the Netherlands, Poland and the USA took part in the Field Days occupying 11 hectares. On 40 trial plots more than 400 new varieties and hybrids as well as plant protection and fertilizer products were presented by companies such as Bayer, BTU-Center, Danube Soya, IKARAI, KWS, Limagrain, Mais, Nufarm, RWA, Stoller, Stefes, Strube, Ukravit Agro, Unifer, Probstdorfer Saatzucht, VNIS, Saaten Union and Dr. Green. One of the highlights of the Field Days was the Sprayer Challenge: leading manufacturers such as Agrifac, Amazone, Apache, Berthoud, John Deere, Horsch and Jacto let the audience compare the quality of their sprayers. Visitors also had the opportunity to watch soil cultivation and harvesting machinery in action. The presentation of underground irrigation systems by companies such as Unifer was another highlight. At the podium discussion “Continuous technology transfer – best practice” visitors had the chance to exchange their points of view with leading representatives of local and foreign agribusiness: among them Dr. Lars Huf-Rühlemann, Deputy Managing Director of DLG International; Michael Horsch, Managing Director of Horsch Maschinen GmbH; Karl-Hubertus Reher, Head of Sales of LEMKEN GmbH & Co; Dirk Stratmann, Spokesman for Ukraine of the German Agribusiness Alliance at the German Committee on Eastern European Economic Relations and General Manager of John Deere International GmbH; Oksana Kryachko, Deputy Managing Director of Kishentsi; Taras Vysotsky, General Director of Ukrainian Agribusiness Club as well as Pavlo Koval, General Director of Ukrainian Agrarian Confederation. The topic of the third day was education in agriculture: 285 students from 14 Ukrainian agricultural universities and colleges visited the International Field Days and learned about the latest innovations in agriculture. Organisers of the International Field Days Ukraine are DLG Ukraine, Agrarian Demonstration and Training Center and IFWexpo Heidelberg GmbH. Professional and technical expertise is provided by the German Agricultural Society (DLG e.V.) and the Ukrainian Research Institute UkrNDIPVT. The organisers are especially grateful to their technical partners, Maschio Gaspardo Ukraine and Company Agro-Temp (exclusive distributor of Zetor in Ukraine), who have provided their machinery to set up the trial plots and the fairgrounds. The next edition of the International Field Days Ukraine will be held in 2019 in Doslidnytske. Post release: "International Field Days Ukraine 2018"
YUGAGRO 2017 - The largest exhibition of Russian agribusiness again successful!